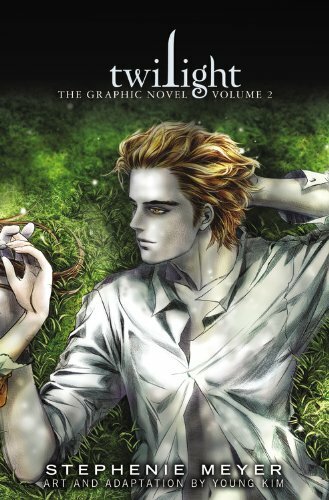 As an unabashed Twilight fan, I couldn't even wait a day to pick up the second volume of the Twilight Graphic Novel, illustrated by Young Kim. The Graphic Novel - both volumes 1 and 2 - is a great addition to the Twilight Universe. Note that I say "addition." The Graphic Novel adds richness to Twilight, but is not strong enough to stand on its own. This is due largely to the inherent nature of a graphic novel - it is heavy on illustrations and lighter on dialogue. Through facial expressions and the short statements, you capture the gist of the plot, but not in the same way as a book full of words. Additionally, if you're not familiar with graphic novels or manga, you may have difficulty following the Twilight Graphic Novel. When I read Volume 1, I had never read manga and I was confused by the pace of the plot and the placement of the drawings. Fast forward 18 months and I have read a great deal of manga. It made a big difference in my comfort level with Volume 2. While the Graphic Novel cannot fully replicate Twilight the book, Volume 2 like Volume 1, is a gorgeous work of art. Young Kim is an amazing artist. The characters are wonderfully depicted; they are living portraits. You see Edward's personality through the drawings: his broodiness, his arrogance, his humor, his temper, his kindness, and his desperate love for Bella. Subtle changes in facial features depict emotion perfectly. Bella is drawn just as I imagine her in the novel: slender, pretty but not too pretty, stubborn, passionate, and overly kind. Of all the characters, I am most pleased with Alice. She is perfect in every way that the movie Alice is not. She is drawn as very thin and delicate looking with short, spiky black hair - a feature the movies keep messing up. Emmett too is drawn well, bulky with dark curly hair - another thing the movies ignore. The highlight of Volume 2 for me was not the baseball game or the final showdown with James. Instead, it was Carlisle's backstory, along with some of other characters' stories. Numerous pages were spent depicting the end of Carlisle's human life and the challenging beginning of his vampire life. Unlike the main story which is drawn in black, white, and gray tones, Carlisle's story was drawn in color that is best described as sepia. There are mixtures of black, brown, orange, and red. Not only does the color scheme separate the backstory from the primary story, but it also emphasizes the tumultuous nature of that time period. We see Carlisle's angry, bigoted father, the ill-fated vampire hunt, Carlisle's painful transformation, his despair, and then his reawakening as a "vegetarian." The visuals make these scenes much richer than the book. So much so, that I would go back and re-read the pages in Volume 2 before I would read the pages in the book to get the best understanding of Carlisle's story. The scenes of Edward, Esme, Rosalie, Emmett, and Alice's transformations are very brief, but similarly rich. While the backstories were my favorite part of Volume 2, the baseball game and the ballet scene were still fabulous. I loved how Ms. Kim managed to convey suspense and anticipating through art, using more lines and faster flowing drawings. Even though I obviously knew what was going to happen, I was still nervous as I flipped through the pages. Like the book, the story is solely through Bella's eyes, so we miss much of what the Cullens did at the ballet studio. But the visuals still manage to give a slightly clearer picture of what happened than the novel. On the whole the art is wonderful. I only had a few quibbles. First, I didn't like the way Ms. Kim drew lips. She drew lines on Bella's bottom lip, presumably to make the lips more visible, but resulted in looking like someone punched Bella in the mouth. Also, I thought the shirts the boys were wearing looked odd. They bunched awkwardly and had unusually high, almost Mandarin collars. Finally, I had difficulty telling Carlisle and Jasper apart. This is somewhat understandable though since their hair color and build are similar. Otherwise, the art was almost perfect. I loved the incorporation of photographs into the pages. They added richness to the scenery. Additionally, the Cullen house was fabulous. A perfect depiction of the big, white Victorian described in the book. The artwork clearly conveyed the openness of the house, with lots of light and a sleek modern interior design. I've mentioned the use of color in the backstory scenes. The final prom scene was enriched with almost full color. You saw the bright blue of Bella's gorgeous prom dress and the brilliant brown and bronze of Bella and Edward's hair. There was also a beautiful twilight/sunset drawing that appropriately closed off the volume. The Twilight Graphic novel, volumes 1 and 2 are a must read for any Twilight fan. It can never replace Twilight the novel and really shouldn't be read unless you're already familiar with the story, but it brings the characters to life in a way that even the movies do not. I highly recommend it. Yes, I love the review! I have finished reading Volume 2 of the manga and I really love the artwork! I can't wait for New Moon to be made into a graphic novel too! I would think that Jasper should be easy to tell because of the scars on face. Or can we not see the scars b/c we aren't vampires? I'd like to read these. Think I'll check them out.